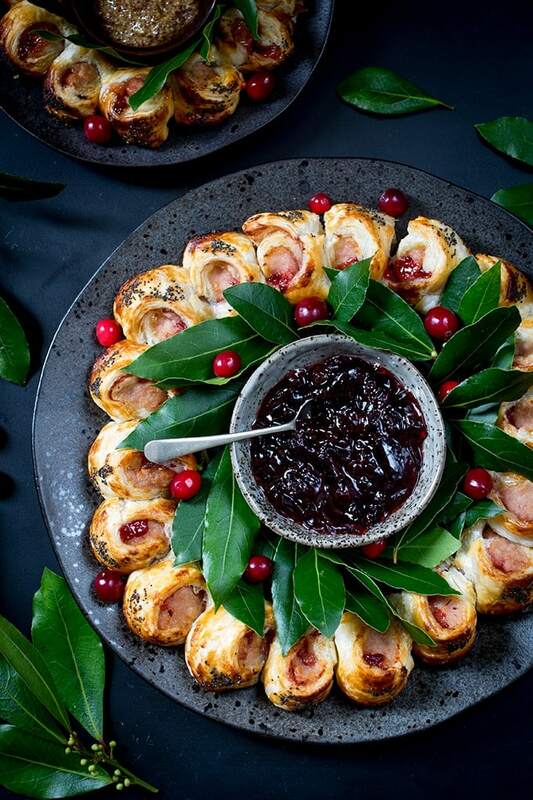 This easy festive sausage roll wreath looks amazing on any party table. Topped with a honey mustard gaze and poppy seeds! It’s been a few months since I won the Neff 2016 cookaholics competition, and time seems to have flown by!. Since competing in the live cook-off I’ve been down to Neff HQ, caught up with the team, and also had a good play with all of the gorgeous kitchen appliances. My prizes have been delivered, and I’m itching to get them installed in my new kitchen just as soon as the rest of the floor is laid and the kitchen cupboards go in. I’ve missed my oven more than anything since the old kitchen got ripped out, and I can’t wait to get my two new slide & hide® ovens in there (yay! two ovens – makes me feel proper posh 🙂 ). 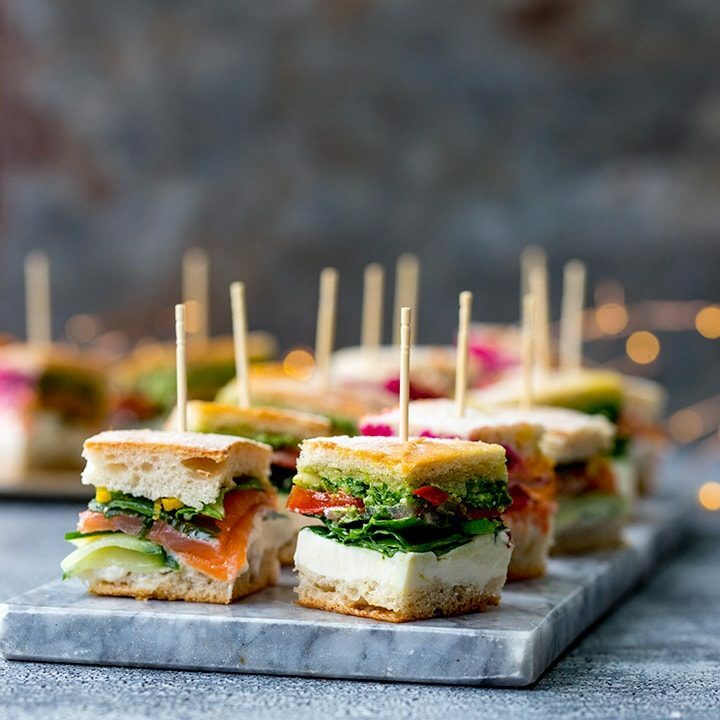 I’ve been using my mum-in-laws kitchen in the meantime, and Neff asked me to create some festive recipes for their Bake it yourself community. 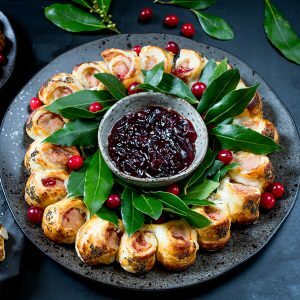 I wanted to go for an easy party food idea for my first post, and these sausage rolls with cranberry sauce shaped into a festive wreath were perfect. You can have them on the table in 40 minutes from start to finish. I ended up making two wreaths, as I know my builders (and Chris and the kids) like a good snack. 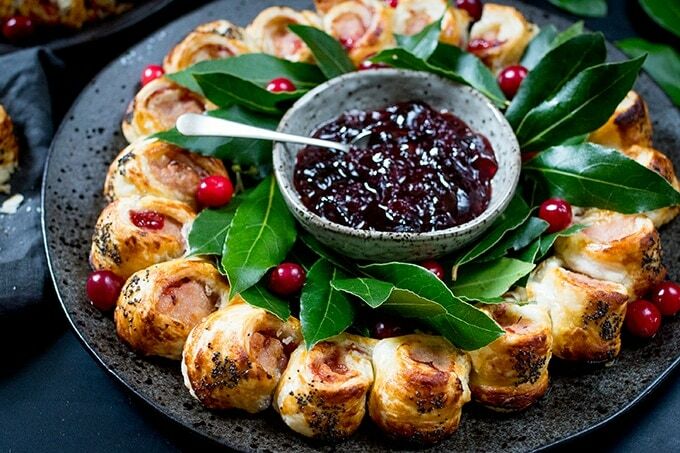 A beautiful Festive Sausage Roll Wreath, reduced to a few crumbs within 10 minutes! I’d say that was fairly successful! I’ll be adding more festive recipes over the next couple of weeks – come back Thursday if you’d like to see my sparkly mince pie truffles! Preheat the oven to 200c/400f/gas mark 6 (CircoTherm® 200°C if you have a Neff oven). Line a large baking tray with non-stick parchment or a silicone mat. Remove the skins from the sausages and unroll the pasty. 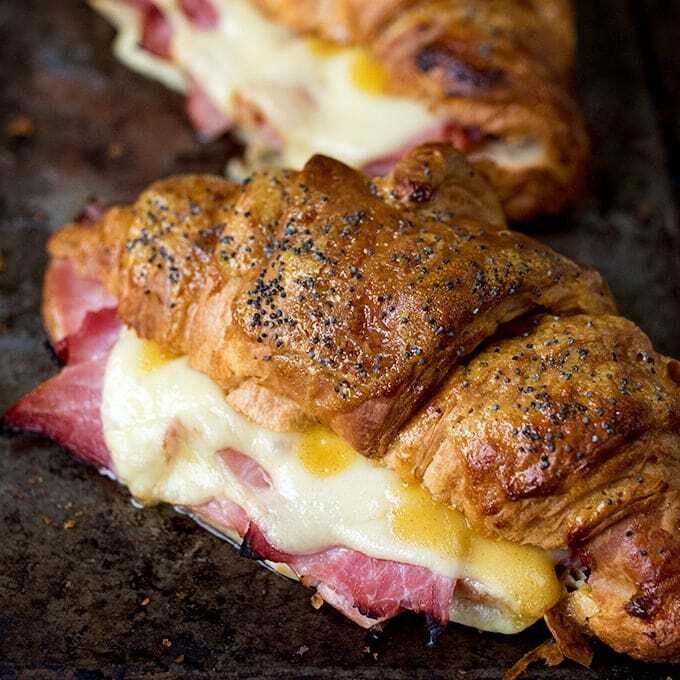 Slice the pastry in half lengthways so you have two long lengths. Line up two and a half sausages along the middle of one of the lengths of pastry. You may need to stretch the sausages slightly to get right to the ends. Repeat with the other lengthy of pastry. Spread the cranberry sauce along the top of each long sausage. 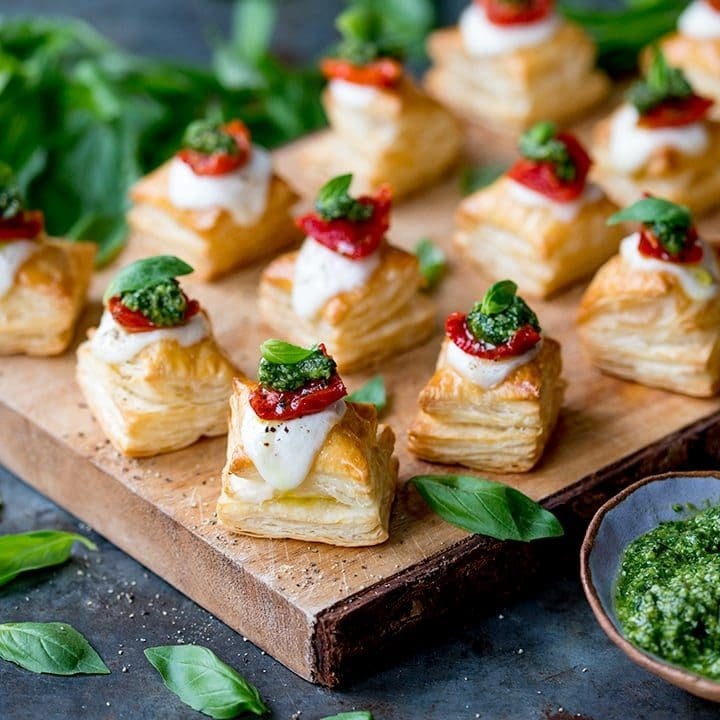 Brush the top length of each of the two pastry pieces with egg wash and roll up the sausages rolls from the bottom. The egg should help the pastry to seal. Turn the sausage rolls over and press the seams shut using the prongs of a fork. Place one long sausage roll onto the baking tray, seam-side-down and shape into a semi-circle. 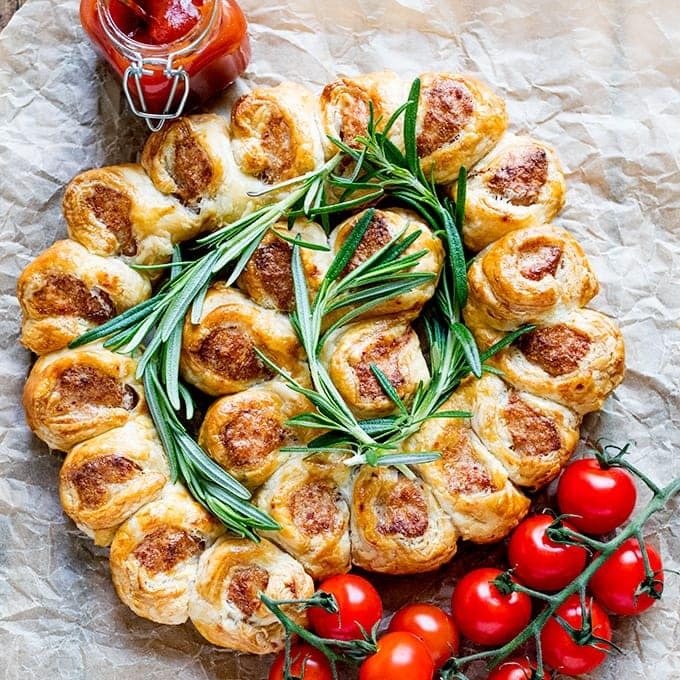 Place the other long sausage roll into a semi-circle – lining it up so you have a sausage roll ring. Seal the ends together using your fingers, plus a little egg wash as the ‘glue’. Cut into the pastry at 3cm intervals to make small sausage rolls - cutting from the outside towards the middle, but don’t cut all the way through. The inside part of the pastry needs to remain intact. Twist each of the sausage rolls 90 degrees so the sausage meat is facing upwards. It’s easier to go round the whole wreath once to twist each sausage roll, then go round it a second time to make sure everything looks neat. Brush all of the visible pastry with egg wash. Then mix together the Dijon mustard and honey. Brush a little of this mixture on the outside edge of the pastry for each sausage roll. Press a pinch of poppy seeds onto the outside edge of each sausage roll. Place the wreath in the oven for 18-25 minutes - until the pastry is golden brown. Take out of the oven and leave to cool slightly (or cool completely if serving the sausage rolls cold). Transfer to a serving plate. Place a small bowl of cranberry sauce in the middle and decorate the inside of the wreath with bay leaves and fresh cranberries. Nutritional Information is per serving, based on getting 18 servings. 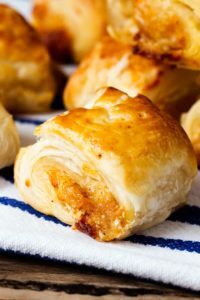 If you like this but want to make an alternative for vegetarians then give these Vegetarian Sausage Rolls a try! Love these sausage rolls so much. I make them all the year round. Here in the states we have jellied cranberry sauce and whole berry sauce, what kind do you use. In other words, one has the berries in it and the other is smooth and doesn’t. What kind of pork sausage, polish? Hi Jane, I used a jelly that had chopped up cranberries in, but a smooth jelly would be fine. The sausage is regular pork English breakfast sausage or chipolatas – if you get those over there? I have had your English breakfast sausage while visiting London, so I know what that is, I can’t get that here so I think I use a Polish type. Our breakfast links are thinner. Thanks for your reply. I will use the whole berry sauce. Yum! I’m following your site and received your e book! Great recipes and lovely ???? site! !